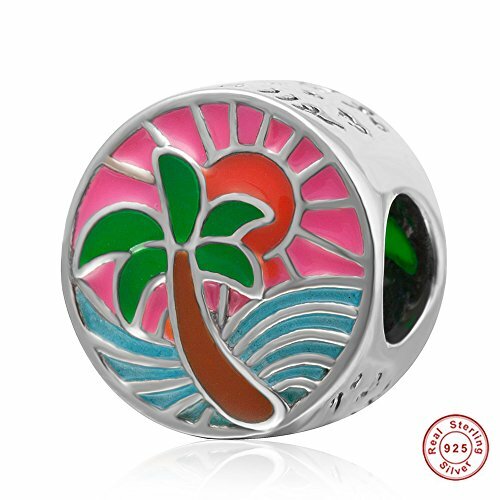 Each European style sterling silver Palm Tree Ocean Sun bead is made by high skilled worker, perfect processing, all handmade, fit perfectly on major brand European chains as well as our very own interchangeable bracelets, necklaces and bangles too. Palm Tree Ocean Sun charm perfect fit on major brand 3mm European charm snake women's bracelets or necklaces. The charms hole size is Approximately 4.8mm, and the bead size is about 10.4*8.4mm, weight is 2.8g. If you have any questions about this product by Fit DIY Charms, contact us by completing and submitting the form below. If you are looking for a specif part number, please include it with your message.